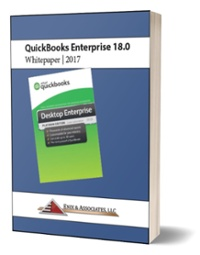 What Features are New in QuickBooks 2017? We all know how frustrating it can be when we run into a scenario where we need to be in Single-User mode but cannot do it since others are logged into the file. Well with Version 2017 it just got easier. In the picture below you can see exactly which users are logged into the company file. Now you can send a request to those users to give them notice of how long they have to save their work and logout. Another great upgrade is the users that are logged in get a chat popup window. They can chat with the Admin user if needed, but most important they also have a timer that shows them specifically how much time they have left to logout. Great new feature! A great improvement in Version 17 is the ability to search within an amount range. Previous versions only allowed for searches that were equal to, or less than or greater than, a given amount. In the picture below you can see that we know the amount we are looking for is between $100 and $150 but are not sure of the exact number. This feature will return all amounts in this range. If you know the date range you can also add that filter to reduce the number transactions from the search. Many times reports can be confusing (especially if not created by you) since you are not 100% sure of which filters have been used. This improvement in Version 17 is long overdue. As shown in the picture below, you now have a “Hide” or “Show” filters option to a report. You can also delete the filter by clicking on the “x” for that filter. If you print or email the report, the applied filters will be listed on the last page. If not needed you can click “Hide” on the report. We have done a lot of auditing and forensic work for our clients. We always tell our clients to never delete a User even if no longer needed or employed. The reason is that the Audit Trail would lose that user and would display [Deleted User] next to the transaction. This makes our forensic work much more difficult. Well, great news! Version 17 now keeps deleted users in the Audit Trail. Another long overdue improvement and hats off to Intuit for incorporating this much-needed feature.